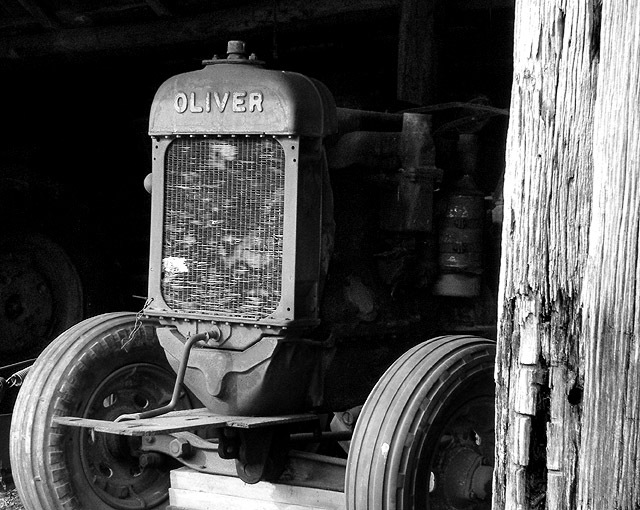 It was difficult to get a good picture of this tractor as the shed that it was in was very messy and the lighting meant that it was very unbalanced. I also wanted people to know that the tractor WAS in a shed rather than sitting in a paddock or something. So I settled for not being able to see everything else in the shed (a brightness and contrast ensures this) and featuring the front of the tractor, framed by the shed. This was nice as the texture of the wood really adds to the feeling of old. A nice shot of an old "beast of burden". Nicely framed by the barn board. B&W is a good choice for this shot. Although I have a disdain for sleeping cats, sleeping babies and old rusted vehicles in this challenge (too obvious), this one is so well executed, I have to grade it well. If there were a way to get the top and left blacks just a bit blacker, it would greatly improve the depth of feeling. nice medium tones in the truck/shadows, though the harsh highlights in the tree are very distracting. Good choice for B/W, I like the detail, good contrasts. I don't know if I like the composition but the subject and the light are very pleasing. Love this shot....a bit tilted though. Proudly hosted by Sargasso Networks. Current Server Time: 04/26/2019 03:44:54 AM EDT.